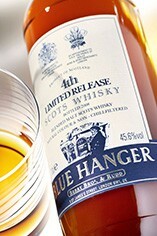 Blue Hanger, a blended malt whisky (a category previously known as vatted malts) is named after William Hanger, the 3rd Lord Coleraine, a loyal customer of Berry Bros. & Rudd during the late 18th century. He was renowned for the striking blue clothes he wore and gained the soubriquet, “Blue Hanger”. Each release of Blue Hanger is a labour of love. Our spirits buyer, Doug McIvor, noses and tastes his way through many samples to identify exceptional casks before working with them to produce the best possible results in terms of aroma, flavour and finish. Every release is unique although there is continuity in overall style to retain the rich, smooth, fruity complexity that makes this Whisky stand out from the crowd. Doug says, “We aim very high and with each release I have learned more about the integrity of the Whisky and what each distillate and type of cask will bring to the party. 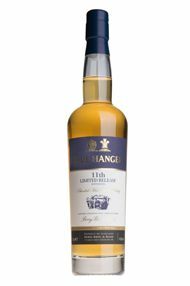 There has always been a strong influence from Sherry casks but I try to rein this in to offer balance and complexity from the other casks"
The Blue Hanger 3rd Limited Release 30 year-old won Best Blended Malt in the 2008 World Whiskies Awards. So called because of the shade of clothes he wore as a young man, William ‘Blue’ Hanger, Lord Coleraine, was a loyal customer of Berrys at the end of the 18th century, and the best dressed man of his day. This exceptional and very limited Blended Malt is just as impeccably turned out, with bewitching aromas of orange peel, vanilla and peat-smoke. The palate is luscious and complex leading to the fruity, smoky finale.